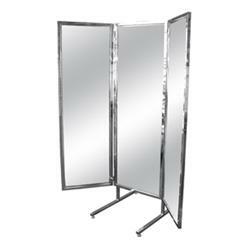 Center Panel: 20"W x 60"H, Side Panels 18"W x 60"H.
Oveall Height including chrome stand 72". This item will be shipped common carrier. Additional freight charges will apply. You will be contacted after order is complete to approve freight amount.